In the months after the heady weeks of May '68, a group of young Europeans search for a way to continue the revolution believed to be just beginning. In 1968 in Paris, France, the something in the air was revolution. In March of that year, a single spark began a revolt when a small group of students at Nanterre University took to the streets to protest conditions at the University. By July, workers had shut down Paris with a general strike in which ten million workers took part, occupying factories and marching in solidarity with students, who occupied the Sorbonne. The objectives were self-management by workers, a decentralization of economic and political power and participatory democracy in the factories and universities. By the end of July, the government of the autocratic Charles de Gaulle was teetering on the brink of collapse. 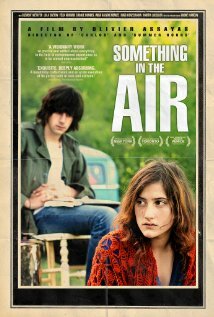 The impact of the 1968 near revolution is still being felt three years later in February, 1971 when Olivier Assayas' semi-autobiographical Something in the Air opens. A demonstration is held at the Place de Clichy in Paris as a teacher in a high school class reads a passage from Pascal, "Between us and Heaven or Hell there is only life, which is the frailest thing in the world." At the same time, the brutal police repression of a young protester, Richard Deshayes, takes place in nearby streets demonstrating the immediacy of Pascal's words. Deshaves loses an eye after being hit in the face by a smoke grenade, and the poster of his bloody head is shown as a symbol of resistance throughout the film. Something in the Air is about coming-of-age and the awakening of conscience, and Assayas has the courage to remind us of the need to align our actions in life with our beliefs and conscience. Events are shown from the perspective of Gilles (Clément Métayer), a 17-year-old high school student who is a prospective filmmaker, painter of considerable talent as well as a political activist. Gilles and his friends Alain (Felix Armand) and Jean-Pierre (Hugo Conzelmann) are activists in the political arena, working to create a better society. They distribute leaflets, contribute articles to left-wing magazines, and spray paint graffiti slogans on the walls. After a security guard is seriously injured by a Molotov cocktail thrown by one of the protesters, however, Gilles and his new girlfriend Christine (Lola Creton) leave the country for Italy. On the trip with a group of activist filmmakers, Gilles is told that he can only borrow a camera only if he does agitprop because "we don't do fiction." At a showing of a revolutionary film, a discussion follows about whether to use conventional style or "revolutionary syntax" to get their message across. Although the film is about ideas, we never know exactly which of the student activists are Anarchists, Trotskyites, Maoists, Marxists, Stalinists, or democratic Socialists, but it hardly seems to matter. What makes the film so unique is not only a script that is highly literate but its portrayal of young people with respect for their minds and an appreciation of their dignity and commitment, attributes normally not seen in films about the counterculture. Author Anne Morris said, "The irony of commitment is that it's deeply liberating  in work, in play, in love." Assayas correctly notes that, in addition to advocating political and economic change, the protesters also want to change outmoded social conventions, particularly the stranglehold of the scientific/materialist paradigm and the puritan sexual mores that place barriers on spiritual growth and full self-expression. What comes across as special, even more than ideas about filmmaking or political theory, are the relationships they have with each other that express their openness and love. The film also blends idealism with music in a way that the songs of Syd Barrett-era, Booker T & the MG's, Nick Drake, and an inspiring rendition of a Phil Ochs song by Johnny Flynn feel organic to the scenes in which they are used. When the students ultimately gain a sense that life is governed by practicality as well as idealism, they gradually drift away to parents, jobs, school and the careers that will shape their lives, but they have already made a difference. Though their immediate objectives were only partially met, later in the year, uprisings began in Poland and Czechoslovakia that would have a profound effect on the Soviet system, protesters marched at the Democratic Convention in Chicago, rioted at Kent State, and the brutal war against a small, peasant country came to an end several years later. Though the film is more about personal goals and ambitions than revolution and Assayas does not shed much light on the causes that the students fought for, no film in recent memory has presented such an authentic view of the immediacy of the period as Something in the Air. The feeling of change is electric and its mood is brilliantly reflected by the film's lack of cynicism and condescension. Assayas brings us back to a time when everything seemed possible and people were truly young because the world, maybe for the first time, began to dream of what it would be like to be young with them.